It was such a fun-filled day biking with Cycle Osaka and meeting great people. Daniel and I felt that we needed to treat ourselves to an awesome dinner because we worked super hard biking over 26 miles. 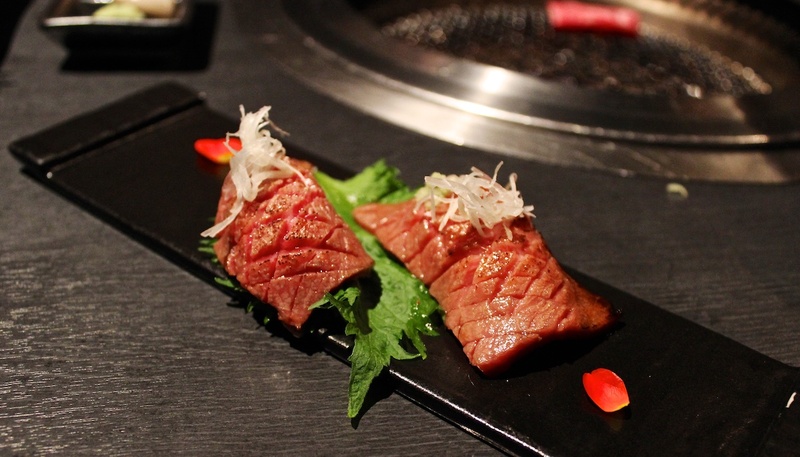 Of course being in Japan, I couldn’t miss out on savoring their perfectly marbled beef. Japanese people are known to raise and groom their cows in luxury. They are fed with high quality food, beers, and even receive daily massages — Talk about living the life. Since this was our last meal in Osaka, we decided to fill our hungry bellies at Matsuzakagyu Yakiniku M, Hozenji Hanare. 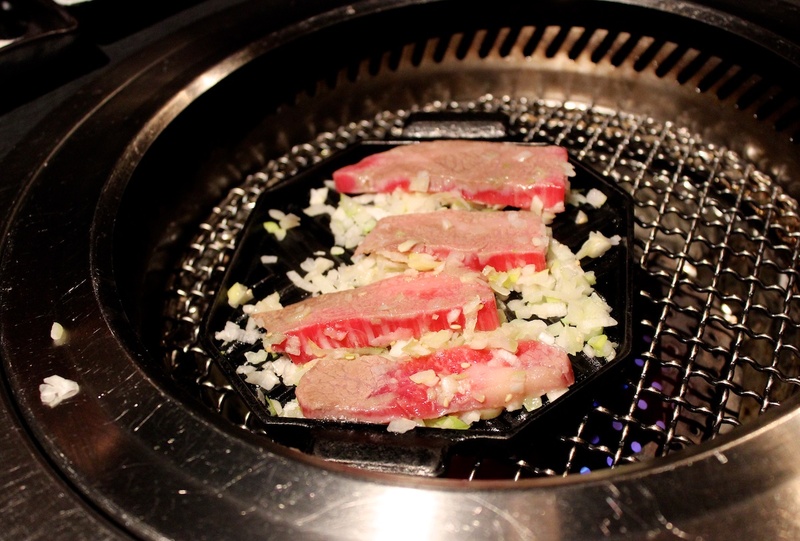 Hozenji Hanare, Floor 2, 松阪牛焼肉 Ｍ 法善寺店 はなれ, (Map). They have a 3rd location named Gyunabe M Hozenji, but I’m not certain that they have the same menu as the first 2 locations. We walked to the Hozenji Yokocho location on a Saturday night without a reservation and they informed us that we had to wait 2.5 hours. Daniel and I looked at each other in agony because we both know we wouldn’t last another 30 minutes. Disappointed, we wandered around Dotonburi area to find another yakiniku-style (“do-it yourself” grilling) restaurant to eat. Just when we were about to blindly walk into a random restaurant, we saw a sign for another Matsuzakagyu Yakiniku M. This location is the Hozenji Hanare and is located on the 2nd floor. We were confused because this location was very close to the first and we didn’t think that they’d put 2 of the same restaurants so close together. Nevertheless, we went up and only had to wait 10 minutes — Hallelujah! I don’t believe there’s a difference in the 2 locations, so try both places for reservations. 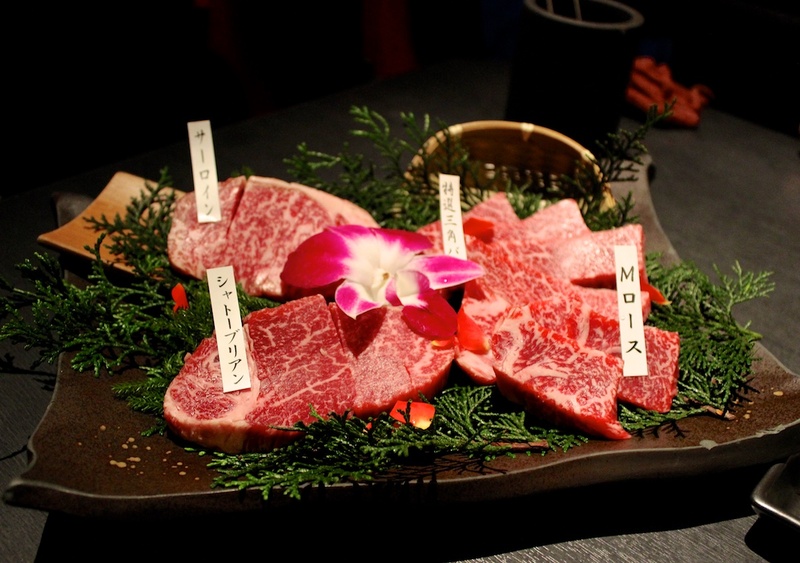 Just like how Kobe Beef is from Kobe, Japan, here they offer their special Matsusaka Beef, from the suburbs of Matsusaka city. The breeders feed the cows with beer with a mixture of shochu (Japanese distilled beverage) to ensure a healthy appetite. The cows also receive regular body massages to provide smooth blood circulations throughout the body. We wanted to try everything, but didn’t know where to start so we figured the Premium Course with 7 courses would be our best bet. The overall service was fast, yet attentive and all of the servers spoke enough English to communicate. 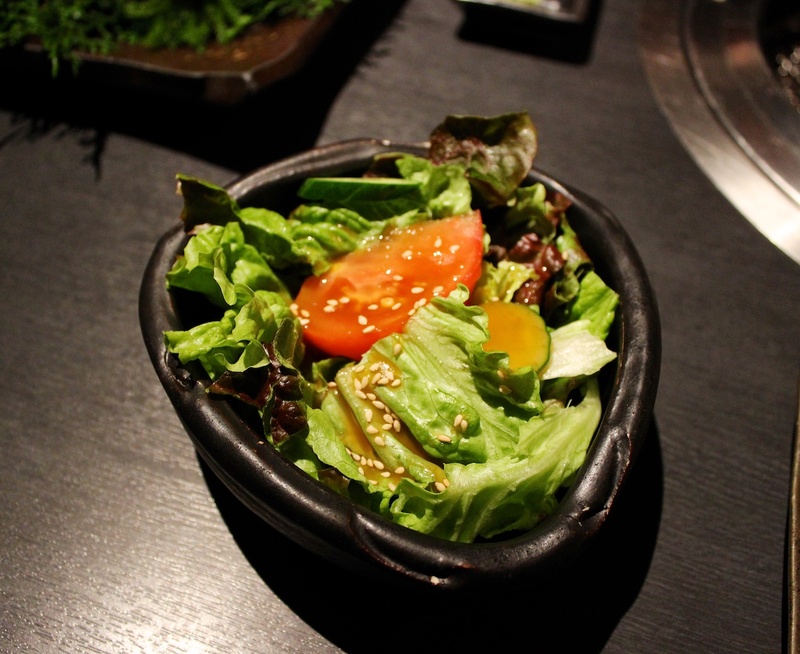 Our Premium Course was 7,800 Yen/person ~ $65 USD. 1st course: Assorted Appetizers. 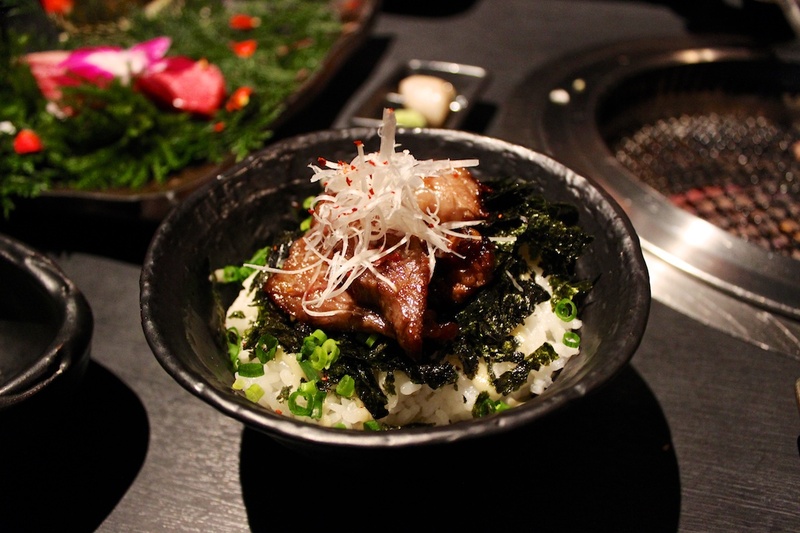 A good opener to an all beef meal offering a different type of meat and texture to warm up your palate. 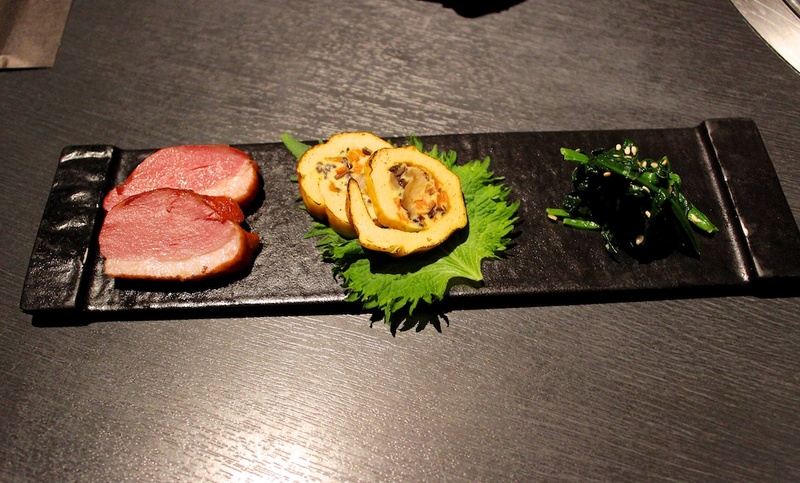 Here we had smoked duck, omelet roll, and pickled vegetable. 2nd course: Lightly Grilled Marbled Beef Sushi. Never had a beef sushi before, but I hope it won’t be my last. Everything was mouth-watering and divine. The meat was succulent and tender. The marbling of the fat provided the melt in your mouth experience and totally lived up to its premium reputation. I mean I’ve had Kobe Beef back in the States before and it was delicious, but only as an appetizer with maybe 2 or 3 pieces. However this time around, I get to indulge in a full platter with 4 different types of cuts. Therefore, I definitely had more time to appreciate the beef. I was happily spoiled. 3rd course: Grilled Matsusaka Medium Toro Kalbi Short Rib With Scallion and Salt. With good beef, you only need 1 or 2 ingredients to elevate the flavor to another level. It’s so simple, yet so delicious. 4th course: House Salad. Some greens before the meat galore. Also, the ginger dressing was very additive. 5th course: Matsusaka Beef (4 different parts): It looked too pretty to eat! Ha, who am I kidding, let’s start grilling! Since Yakiniku is a “do-it-yourself” grilling experience, you can grill your meat to your liking, but for me, the rarer the better. I don’t want to let the fat melt away. 6th course: Choice of Rice with Kalbi and Wasabi Sauce or Cold noodles. We chose the rice. By this time, we were stuffed, but just look at that soft rice, juicy Kalbi, and flaky seaweeds. It was glorious. Take me to Nom-Central please! 7th course: Dessert of the Day. 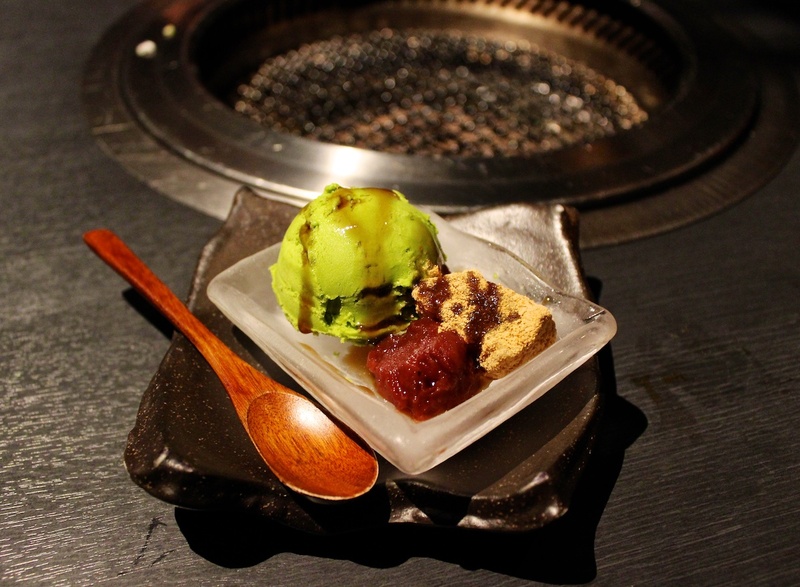 Green tea ice cream with mochi and red bean paste. Basically these 3 desserts summed up Japan for me. In other words, it was heavenly.